The Friday after Thanksgiving is known by US Consumers as Black Friday. Many shoppers begin searching for Black Friday deals seven to ten days before Black Friday actually arrives. A quick way to create a list of up to the minute information on Black Friday deals is to search Google News and Google Blog search. Google News provides links to recognized news media stories about Black Friday deals while Google Blog Search provides lists of blogs with information not often available from traditional news sources. 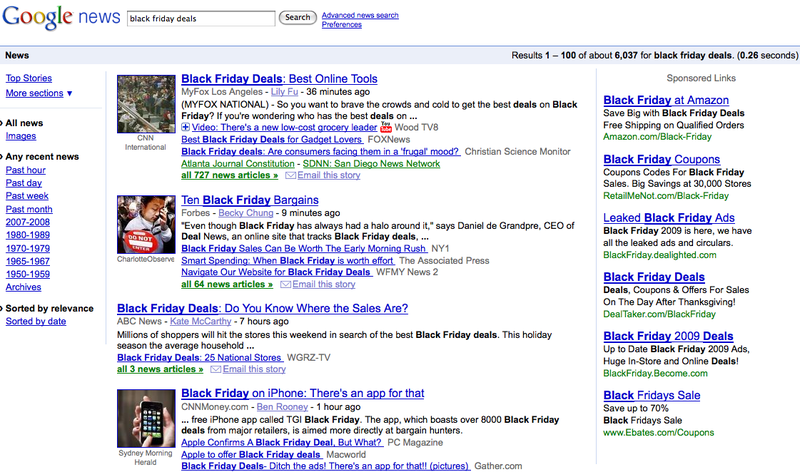 Combined Google News and Google Blog search provide a wealth of Black Friday deals information. 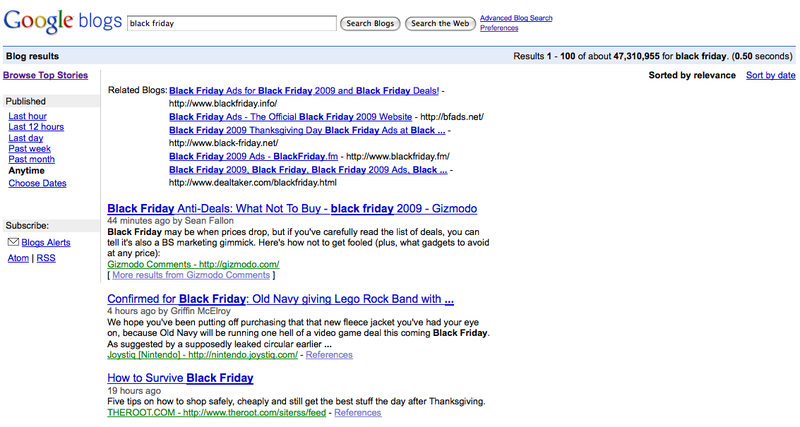 This entry was posted on November 24, 2009 at 4:35 pm and is filed under Finding Black Friday Deals, Google, Google Blog Search, Google News. You can follow any responses to this entry through the RSS 2.0 feed. You can leave a response, or trackback from your own site. I don’t understand why people just don’t go to sites like DealCatcher.com or Allisonstravels.com. It’s a lot easier than sorting through all the crap that you usually have to get through on Google. I love the search engine, but there’s still too much hassle.